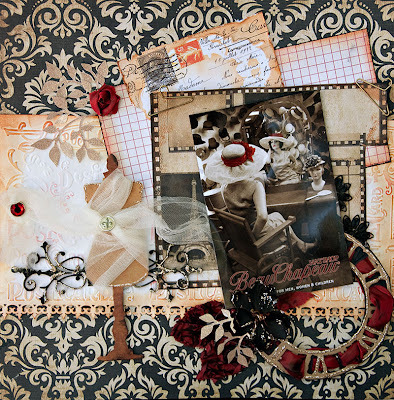 The Hat Shoppe - created with the Scraps Of Darkness Sept. kit called Passages. This was made for the the Darkest Side challenge at Scraps Of Darkness. This is run by forevervampress, Celina, and the topic was communication. This form of communication is the postcard. This was the postcard I picked up after husband and I both bought hats from this really cool hat store in Niagara-on-the-Lake, Ontario, Canada. I also tied the theme together by using Tim Holtz Alteration Fades texture plates -Postcards. The papers used here were the Teresa Collins -World Traveler collection. I added a touch of Dusty Attic on the bottom near my dress form, painted them black and finished them with Stickles in Platinum. I do believe Platinum is my "go-to" Stickles color. 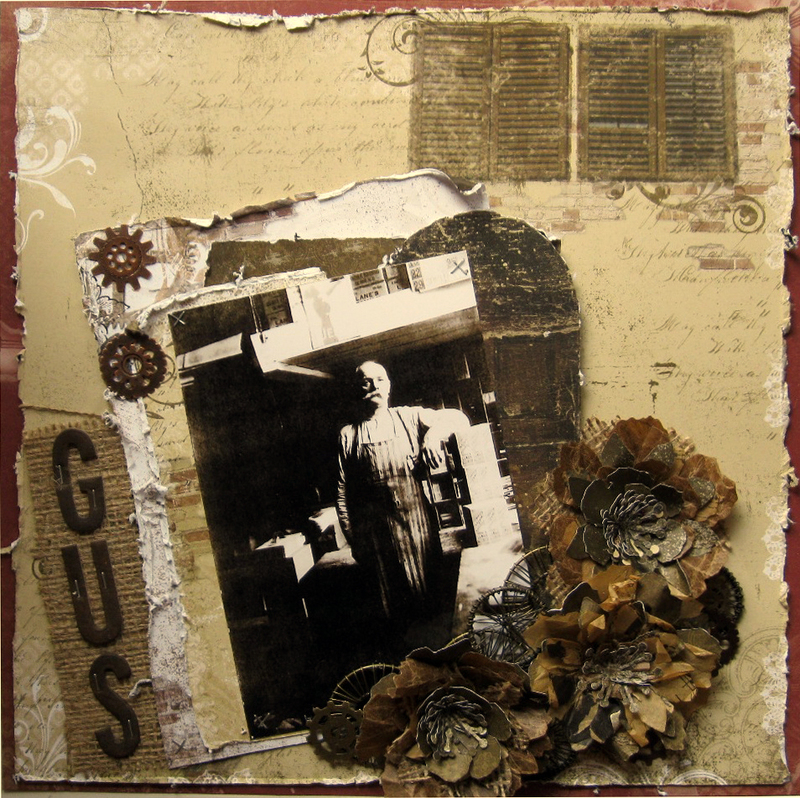 The Tim Holtz weathered clock die was used below. I just weaved a burgundy ribbon through it and added some stickles in,,,yeah, you guessed it. Platinum. 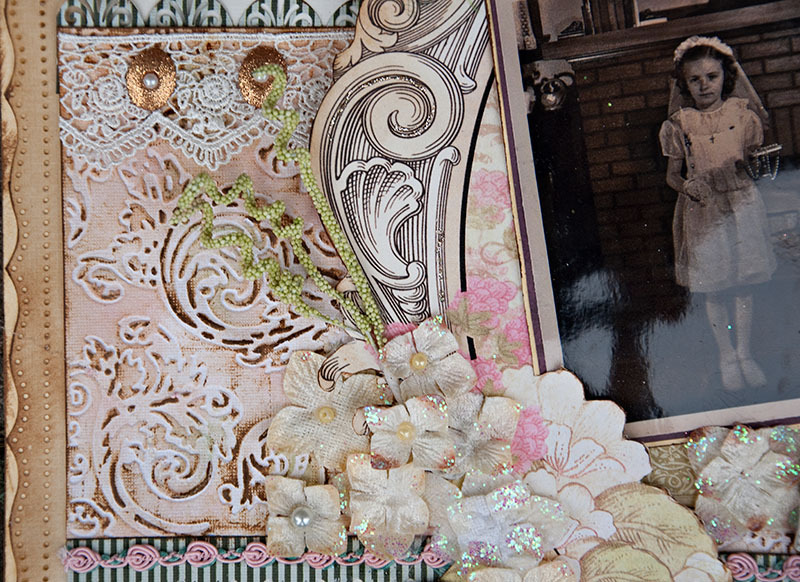 I also added the Prima Lovely Collection Fabric Leaves. They have such a rich color and texture. My black flower was just a stash floral from Michaels with some stickles on the top. The kit is totally gorgeous and packed with amazing goodness. You can take it vintage, feminine, or grungy and dark. Whatever your heart desires. It all works. 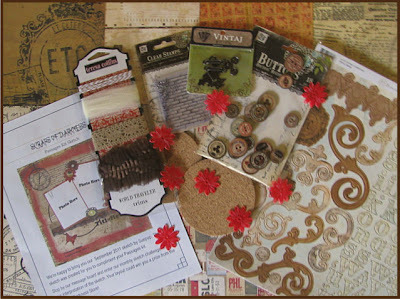 Check out the Scraps Of Darkness gallery to see how you can make thhe kit fit your scrappy style. Thanks a bunch for letting me into your day. This was created using the Scraps Of Darkness sketch design by suepup, Charlotte Jenkins. You can see the whole crazy write-up here in Escape Kitty's blog. Yeah, she's a blogger and a traveler. It tells of the long genealogy of Escape Kitty going back to the Mayflower, rumor has it. The short version: Kitty family landed in America. Fast forward to Great Great Grand Kitty in her youth. She was certainly adventurous, traveling about the country hopping rides on stage coaches (as seen in the photo), trains, horseback and whatnot to cross the big land. This photo was taken before she started her kitten family. The resemblance to Escape Kitty is remarkable, don'tcha think? I used a doily from the Wilton cake decorating section at my local craft store. 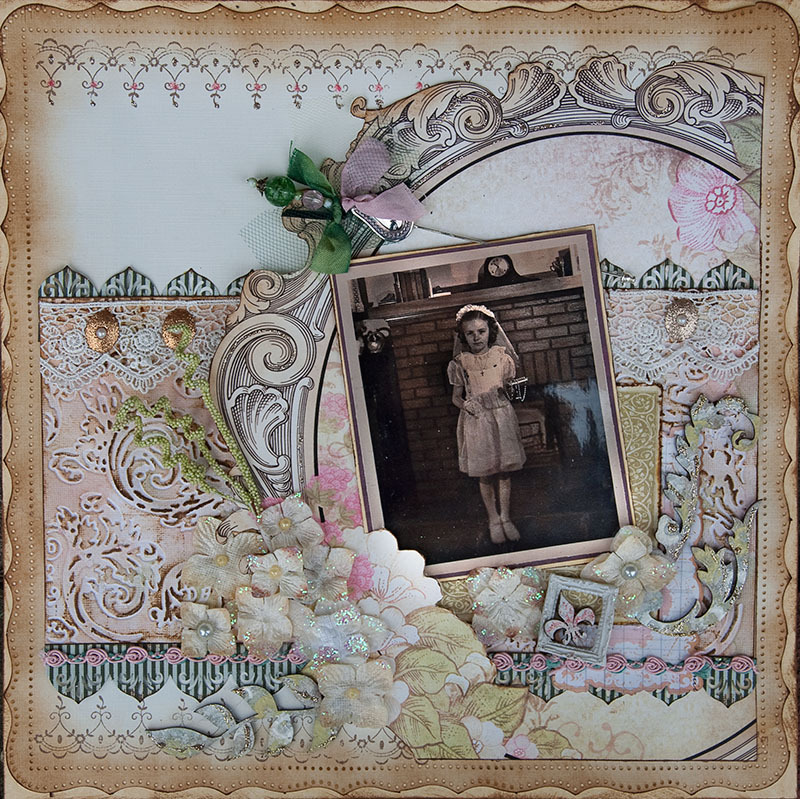 The used Tim Holtz Wild Honey on it and finished it with Tim Holtz Vintage Photo. Very appropriate for this real vintage layout (wink). Here is a close up of the details in Granny's adventure. 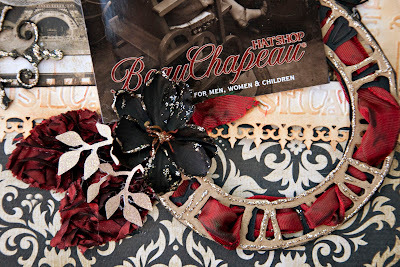 The broach is a clearance find in the jewelry section at my craft store. We were on the Naples Pier in Florida one evening taking our walk. The evening was clear, warm, beautiful and perfect. As we were leaving I took this photo. It was a sad image for me. The older lady in the photo was there waiting for the sun to set, waiting for twilight. All alone – out of focus. This is what memory loss is like to me. This is what Alzheimer's Disease is like. The chicken wire is the separation and inability to break through the mind. My father-in-law suffers from this devastating monster of a disease. He is all alone in his mind. I can no longer see the real person he was. He is fuzzy, blurry and completely out of focus. He is in his twilight and sunset days and he is alone while the world around him is beautiful, sunny and thrives. 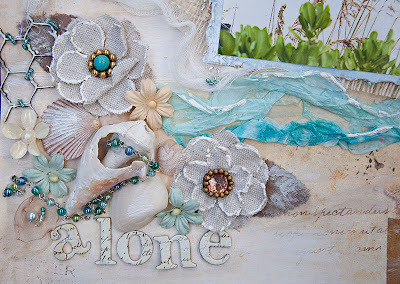 Flowers - Prima that I accented with white puffy paint for sea foam. 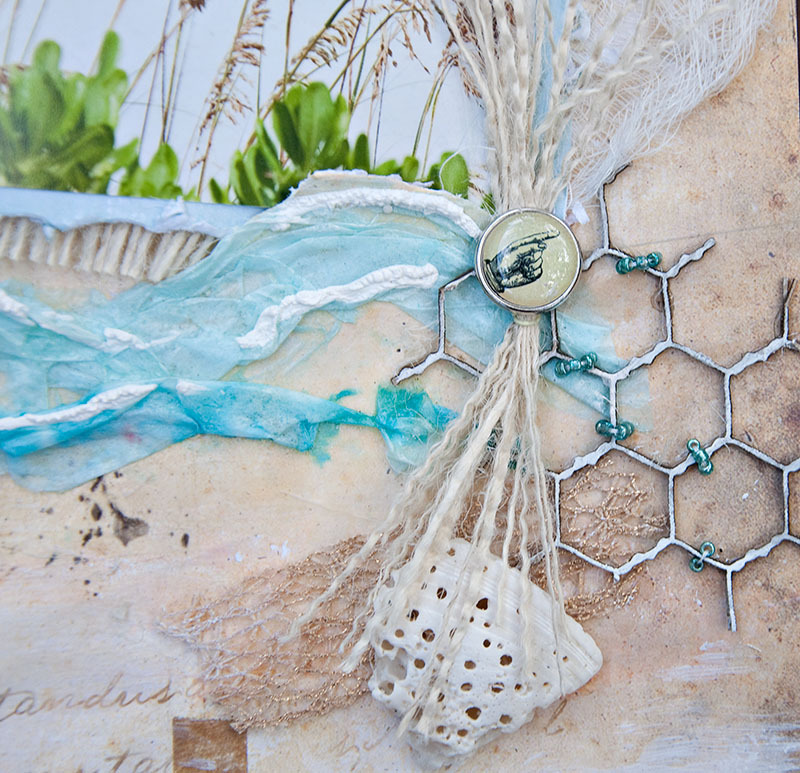 Dusty Attic - Chicken wire with blue beads sewn on. 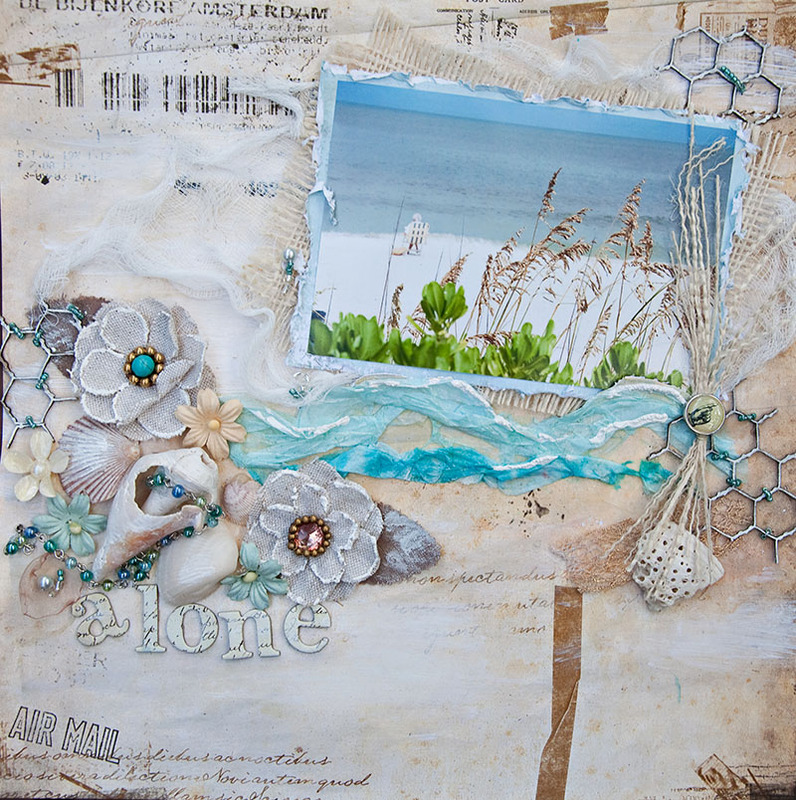 Waves - blue tissue paper layered with modpodge. The second layer of waves was inked with Tim Holtz Broken China. I added some puffy paint on the top for more sea foam. 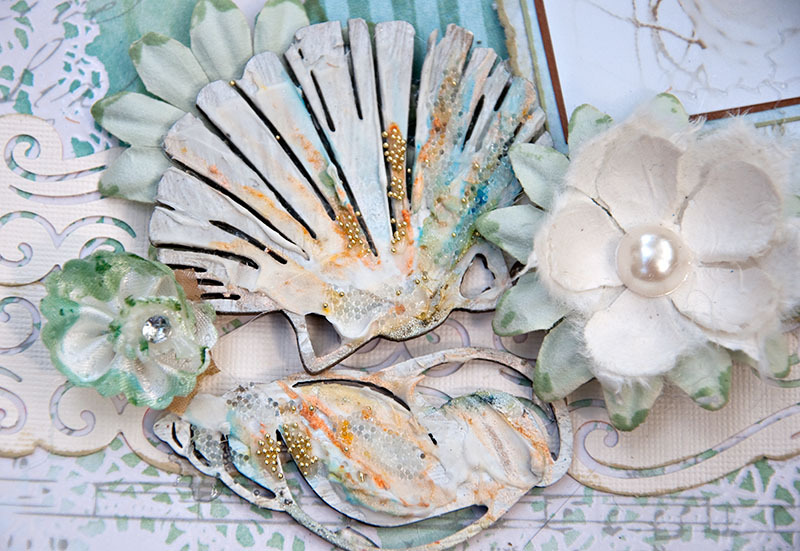 Shells - shells are from the Naples beach. I sift through the beach looking for the perfect shells to take home and scrap. This year I had 8 lbs of sand and shells to move, causing my luggage to be overweight. The fee for overweight luggage is $40. No way is my sand and shell collection worth $40, so I did what all women would do........had my husband carry the loot in his carry-on. hahahahaha. Oh my husband is a great sport - and I am a muscular wimp. 8lbs is a lot when I am toting my 15 lb camera bag and its assemblage of accessories and batteries and whatnot. This was created for the Skeletons in the Closet Challenge over at Scraps Of Darkness to scrap the inner you. The Sept. Kit is a jaw dropper. Come check us out. A photo of me from Florida, July 2011. Thanks to some photo editing with Florabella, I was able to achieve this chocolaty black and white edit. My background paper is a piece of test scrap paper I have had for about a year - misting and spraying and inking over and over on it. 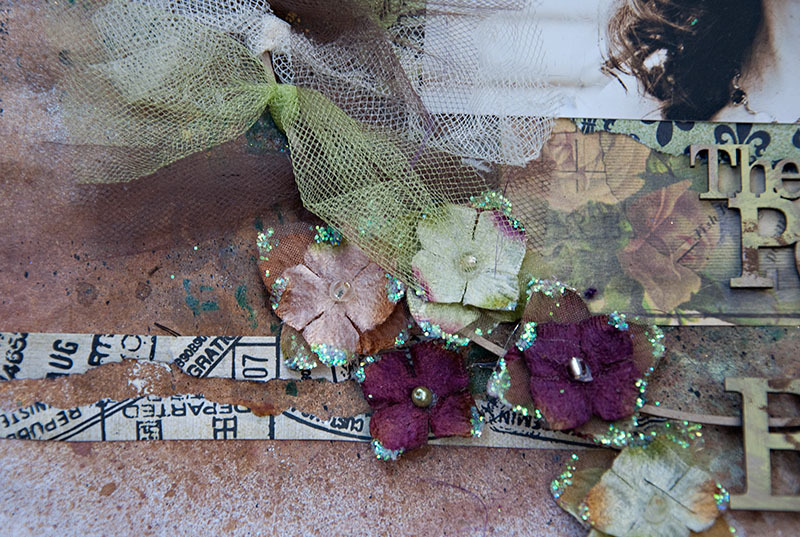 It was a rich grunge color and perfect to express the inner me - kind of ragged, disjointed, yet happy and at peace. The really great part? I used the chippy that I received from the Dusty Attic prize pack. 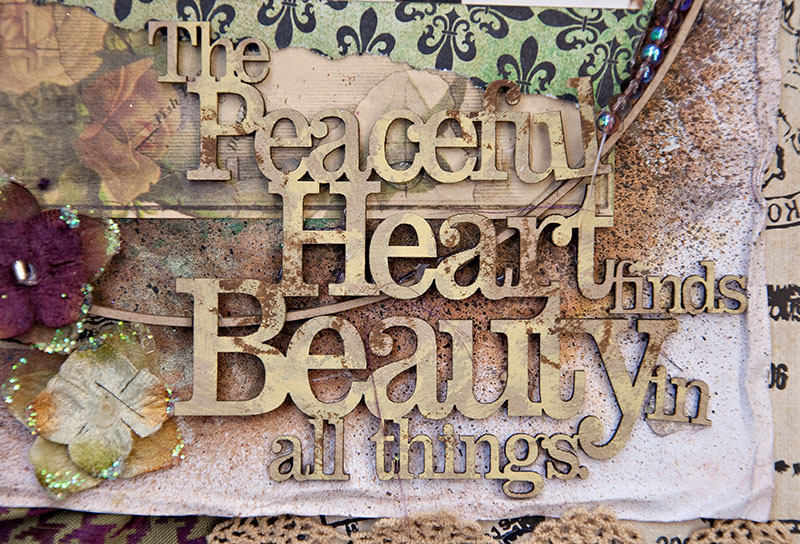 "The Peaceful Heart finds Beauty in all things". So perfect. Thanks Dusty Attic and thanks to you for looking. 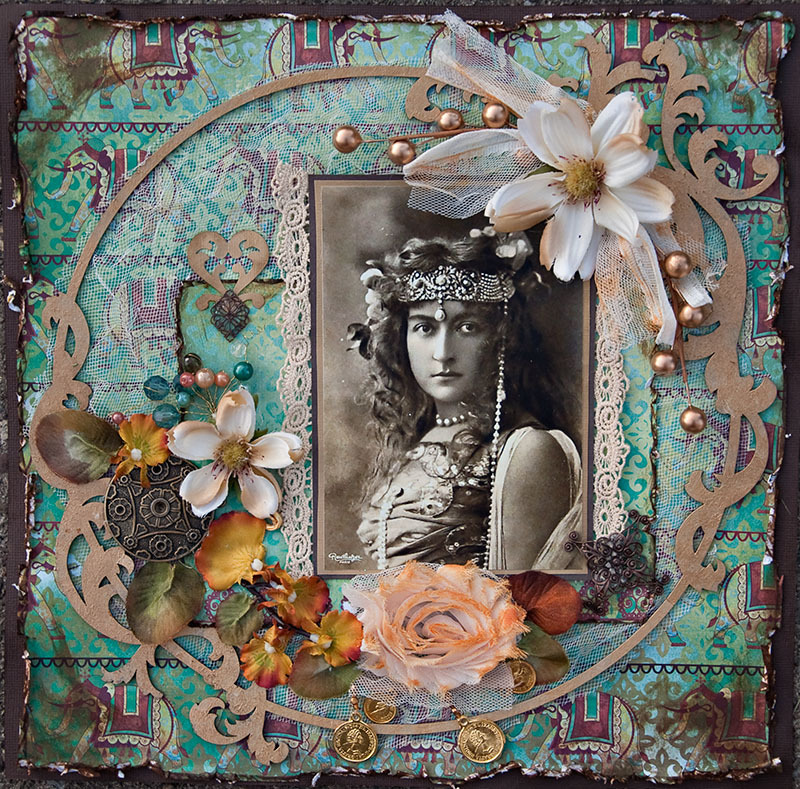 Oh - the circle I used was the Dusty Attic circle spacers from the Large Dusty Attic clock faces. Another cool unexpected little bonus from the fine folks at Dusty Attic. This is a photo I took in Oct 2009 inside an antique shop. This pretty glass was in the window asking me to buy it and take it home. Well, I looked at the little price tag hanging off the side and quickly decided I'd rather just take a photograph. I am NOT a wealthy scrapper. 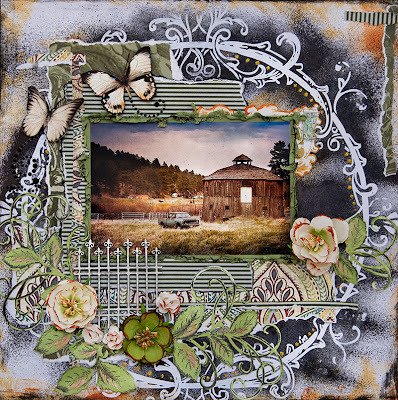 This was created using the Sept. Scraps Of Darkness kit for the sketch challenge at Dusty Attic. I used the sketch by Michelle Grant - she is amazing and so inspirational. 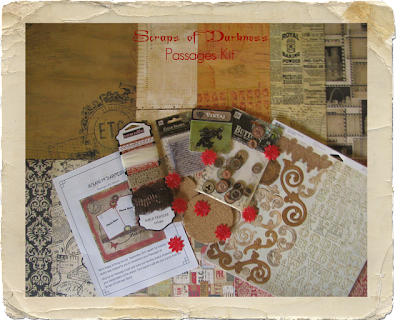 Scraps of Darkness Sept Passages Kit It's REVEAL DAY! Here is the Sept. Scraps Of Darkness Kit, Passages. What is Reveal Day to me? I can relate Reveal Day emotions and excitement to Christmas Day. The planning starts a few weeks earlier (OK I am a procrastinator). You wait to get your paycheck (which is the kit) and then you shop and bake like a crazy person. Big accent on the SHOP! Love that part. Not real crazy about the bake, but it's part of the ritual for the big day. The shopping and baking are akin to creating the layouts. I think carefully about what gifts I want to purchase my husband or children just as I also have to think about the look and feel of the paper and embellies of the kit. What look do I want to achieve - what message am I conveying and most important , what photo selections I make. 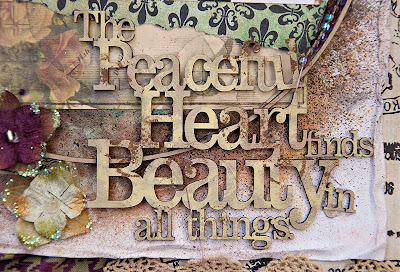 When I am satisfied and I have my scrapping done, I sit and wait for the big day. It can be a agonizing wait. Remember that loooooong wait as a child? ugh - it dragged on for ever it seemed. You day dreamed about opening your gifts and the joys of Christmas morning. Well, before Reveal Day, I wonder what path the rest of the design team wandered. What styled will be mastered. 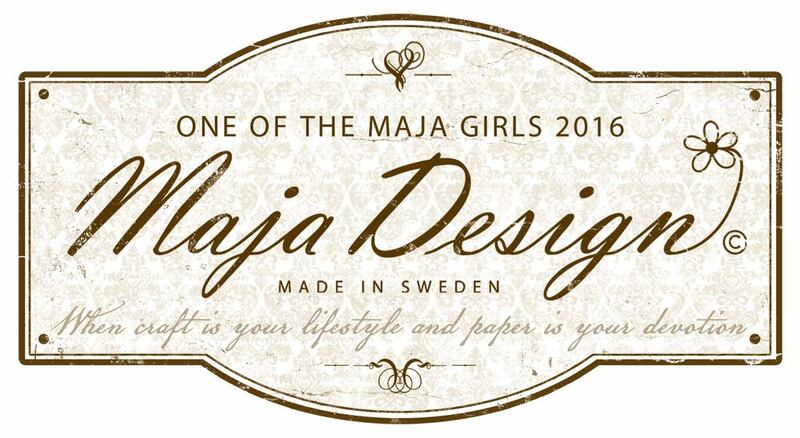 What innovative design will they showcase. ohhhhh soo exciting. What I love about Scraps Of Darkness kits are that they provide you with the ability to be as diverse as you want them to be. 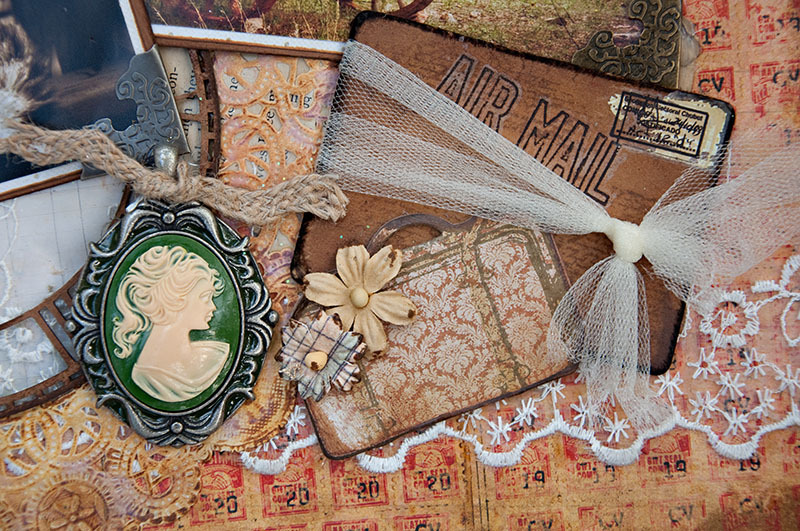 Turn it romantic, vintage, whimsical or grunge it up! It all works with this kit. ANYWAY the long wait is OVER!!!!! Here is what you will find inside this kit. I am sure you will love this beautiful collection. Click here to see what I have done with the kit as well as the beautiful creations of the entire wildly talented Scraps Of Darkness Design Team . 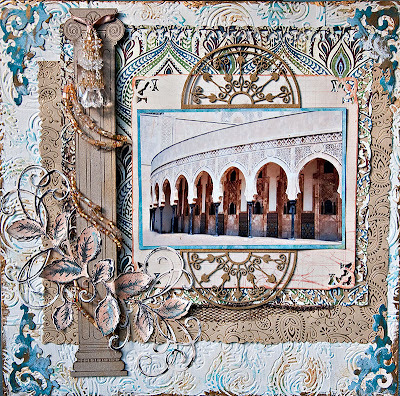 This was a layout I did for the Scraps Of Darkness , Marrakesh Express Kit in July. 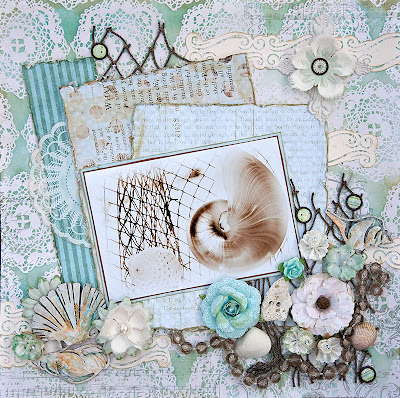 I used an image from Izabelle Vintage http://creativesouls.ning.com/freevintageimages, the edges were distressed using the Zutter Distress it all, inked and layered. 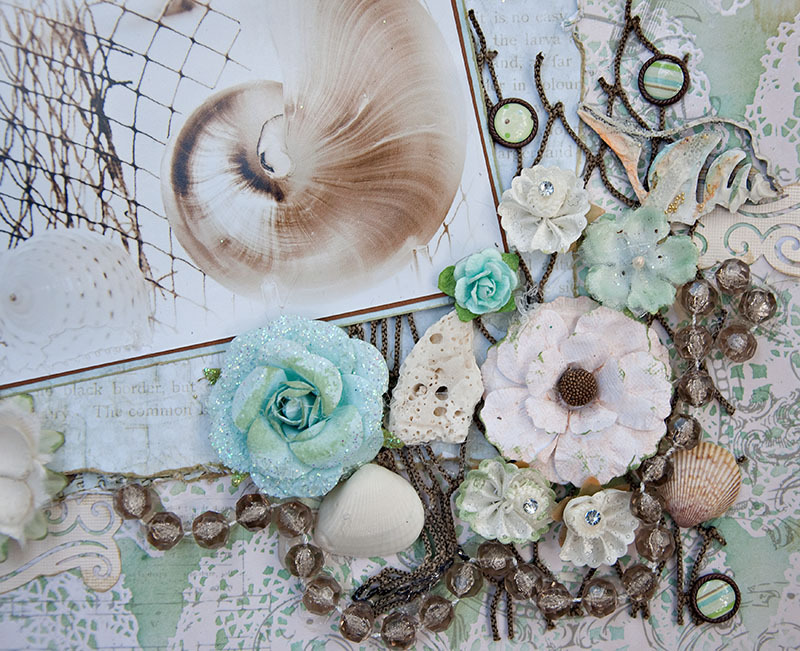 A Dusty Attic frame was painted with a paint dabber, Bridal netting was used to mimic the floral headpiece in the photo. LisaN worked very hard bringing Scraps of Darkness and the design team to the attention of Creative Imaginations. This resulted in a 3 day feature on the design team. Thanks a bunch for looking and thanks Lisa, Melinda and all the design team at Scraps Of Darkness. There is something so soothing about the sea, shells, the colors associated with the ocean, and for us, everything Florida. We just love Florida. We try to make it to Florida at least once a year. 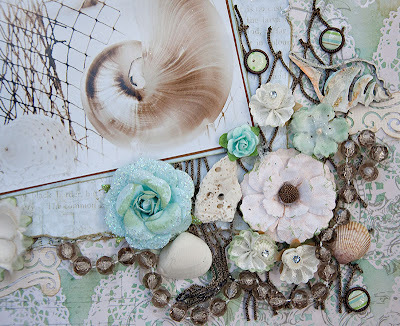 In our recent trip to Napes, FL in July 2011, we found a delightful shop on the Old Naples Pier and I saw these shells in the store window - they were picking up the morning sunlight in the window and I had to capture the peaceful picture. 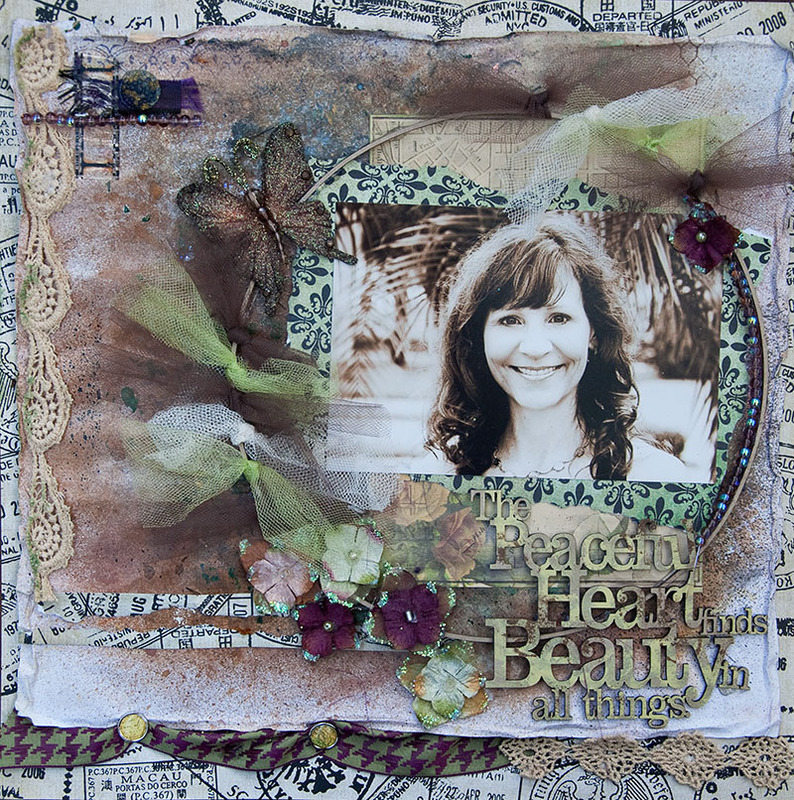 This layout was done for a round robin challenge and I followed my friend, Peggy . She's a gifted and amazing scrapper and provides us all with such heartfelt inspiration. Turns out, Peggy emailed me on every site she could possibly find to alert me that one of the participants was unable to play this week. I am running the challenge so I need to find a replacement. Usually not much of a problem, except that it's Sat afternoon and posting is for Monday. Not much time for people to step in so I opted to fill in. This resulted in me being a highly supportive wife and encouraging my husband to go out with buddies for the evening. LOL. Get me some solitary scrapping time and stare at Peggy's LO for some lightening speed inspiration. 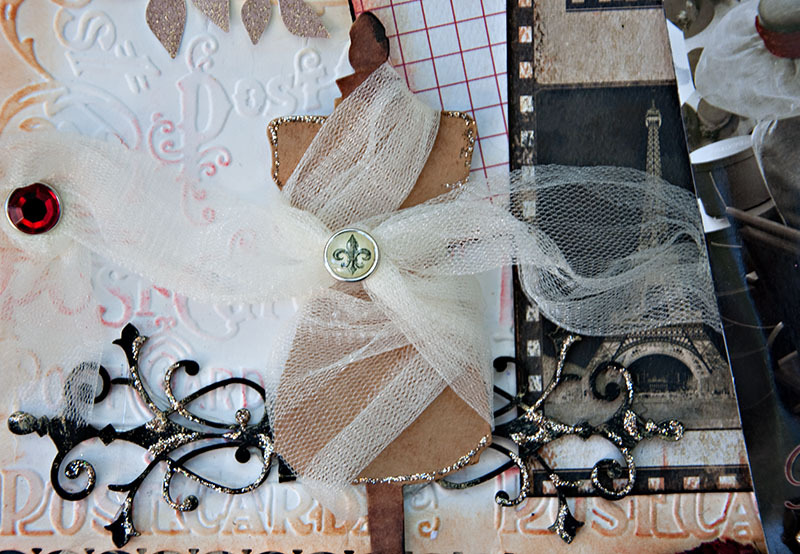 My background :paper is Pink Paislee- House of Three- Parisian Anthology resist paper in Lovely Lace. 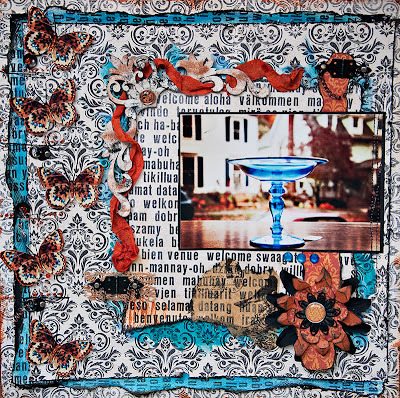 I started off with Timmy Holtz distress ink in Broken China thinking I needed blue. Nope it was too much blue. Then I added Timmy's Bundled Sage to tone down the blue and achieve more of a sea-glass blue green color that I could live with. Thanks to Timmy's blending tool, Timmy has a color for every occasion. 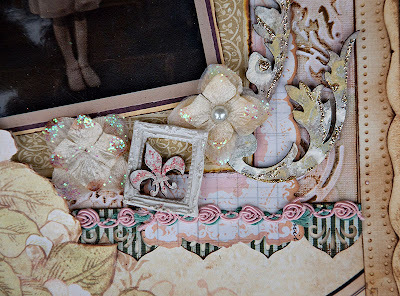 Here are a few close ups of the layout cluster details. The first spotlights the Dusty Attic seashells. 1. Started off painting them white with Adirondack Paint in Snowcap. 2. Got my little pallet knife out and spread some gesso on top of the dry chippies. I really clumped it on thick for some texture. 3. Using my water pen, added some highlights of Lindy's Stamp Gang brand Magicals. colors: Blue hawaiian, A Bit O'Bubbly, and My Mojito Green. These all came in a recent color add on kit from Scraps of Darkness! It was a really cool, fun color add-on. 4. Finished the pieces off with some micro beads to emulate sand granules stuck in the shells. Thanks for taking the time to look at these. And much thanks to Peggy for the design and creative inspiration. 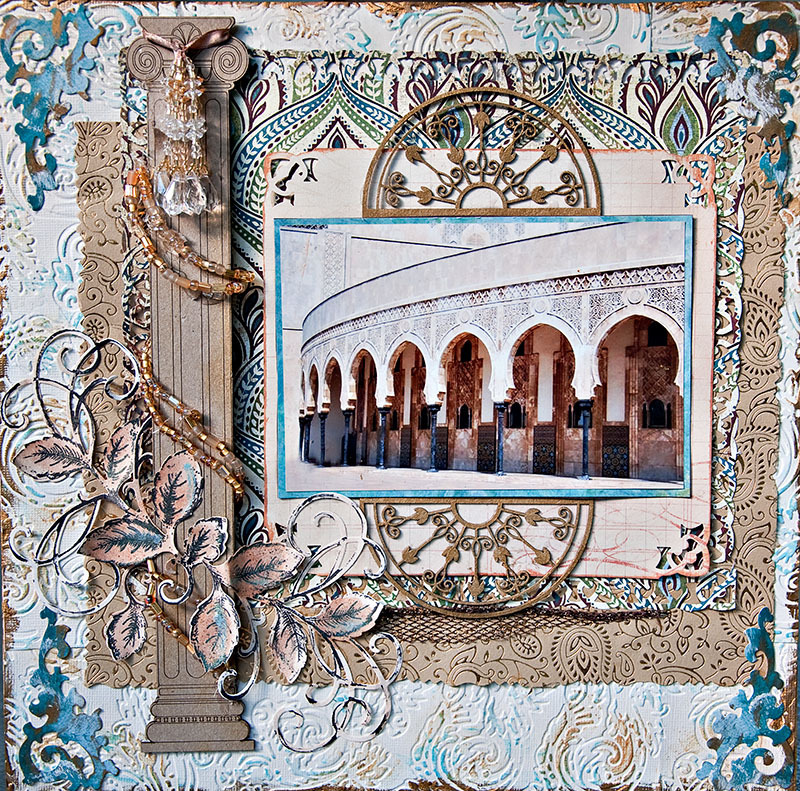 This layout, Palace of Morocco, won the Dusty Attic 2nd Birthday Bash in July 2011. I was so excited because I stayed up late every evening to complete the Birthday challenges. I was supposed to be packing for vacation, yet I scrapped on. At one point, the last night before our trip, I had no choice to break away from the scrapping table and pack. The other choice would have been to keep scrapping the Birthday Bash challenges and let my husband pack for me. Not a chance. He see no value in bringing more than one pair of shoes. Anyway, fast forward to yesterday. I received my prize package in the mail. Ohhhhhh my little heart darn near burst! Here is a photo of my goodies. Thanks kind and wonderful folks at Dusty Attic. I love everything. You were so very generous. Dusty Attic - Featured Artist for the month of September 2011. ME!!!!! I was at work when I received an email from Dusty Attic. When I opened it, I let out a tiny scream - well loud enough for my co-worker to hear it. She entered my office and asked if I was OK. It's times like this that my professional world and my artistic "after hours" world cross over and collide. While they do collide in a great way, I still have to watch my shrieks of joy while in my office lest my co-workers think me mad and crazy. 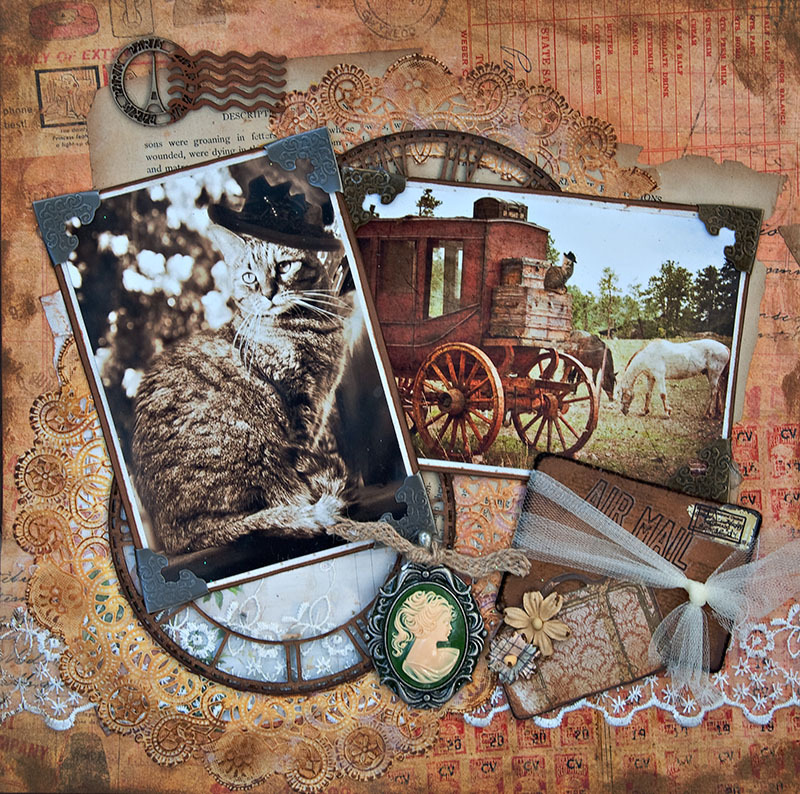 I am so very thankful to the staff at Dusty Attic for selecting my work. Oh my goodness, I still am dizzy with joy. Such an honor. I do so very much adore my Dusty Attic stash. This is a photo of my mother back from 1947. She was a tender age of seven and making her First Holy Communion. Dressed in white, she was a little angel then and is our family Saint now. She is often called St. Carol for her kindness and goodness. This close up shows the Dusty Attic leaves and a mini fleur de lis . The Dusty Attic leaves were painted with Adirondack paint in Snow Cap first, then dabbed with Adirondack paint in willow. I almost always start a Dusty Attic piece with Snow Cap or with white gesso. Finally, the finishing touch is a quick brush over of Stickles in platinum. Platinum Stickles is my favorite color. I find it my "go to" bottle. Here you can see a large section of my home made background paper. I had fun creating this. 1. I ran some ivory cardstock through the Sizzix using Tim Holtz Embossing Folders in Damask. 2. 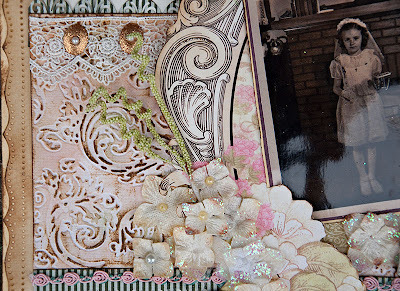 Gently wiped the top of the embossed cardstock with the top of the Tim Holtz distressing ink in Vintage Photo. Gotta be careful that you keep the ink pad straight so it hits the raised parts of the cardstock. 3. Using the Ranger blending tool, I added some Tim Holtz distressing ink in Spun Sugar on the "valleys" of the cardstock. 4. 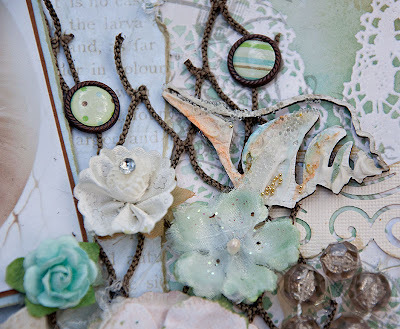 Using the blending tool once again, I added just a tiny bit of Tim Holtz distressing ink in Rubbed Sage, also in the "valleys" but just sparingly. 5. 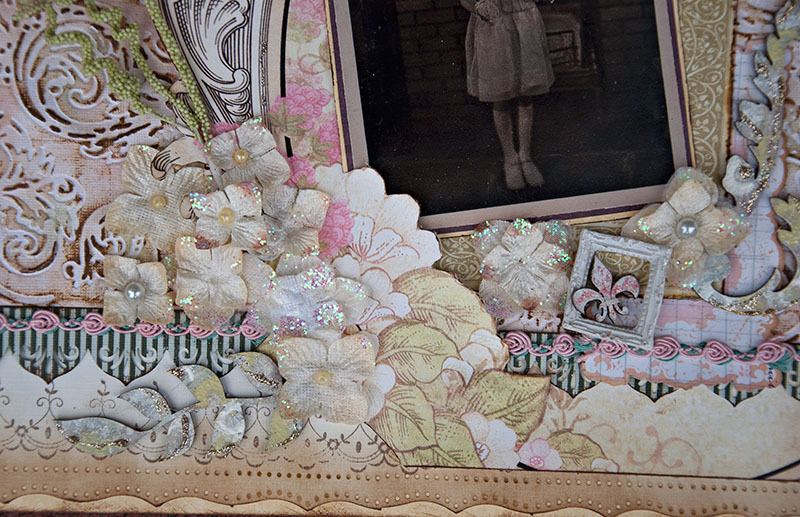 Added my lace and then my brads over the top to complete my hand made patterned paper panel. This is the lager view of my embellishments on the bottom of this layout. 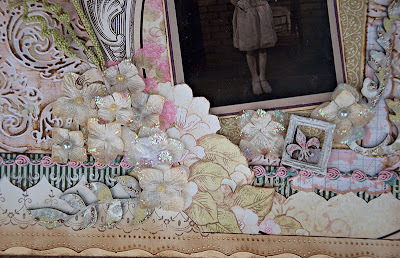 I did rub the Petaloo Canterbury flowers with Tim Holtz Distressing ink in Wild Honey to age them a bit. This photo was taken while on a scrapping trip to Colorado back in May 2011. I was shooting photos with fellow scrappers Droopidog, Raining, Kathi2, and Sherrenae and we had a grand time. Then we went back to the scrapping cabin and chatted, laughed, scrapped, ate, laughed, drank some wine and had a rather large piece of the best cake ever. Well, at least I had cake – 2 pieces actually. Not sure if anyone else did but I have a sweet tooth. But that was a perfect day in the life of a scrapper. 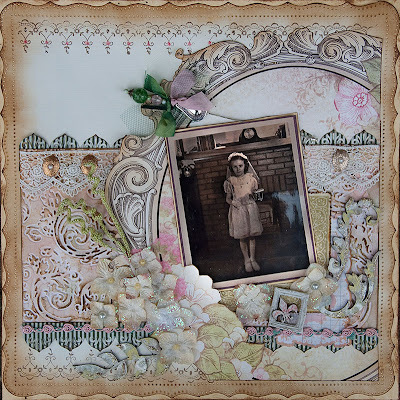 I created this with the scrumptious August Kit from Scraps Of Darkness. Come visit us at Scraps Of Darkness, where you will have a ton of scrappy fun- add a piece of cake and make it a perfect day! Interestingly enough, I paired the July Scraps of Darkness leftover papers with the Aug kit because they were perfect matches. I also used the Dusty Attic fence and painted it white. The background paper I used was an old Heidi Swapp resist paper. 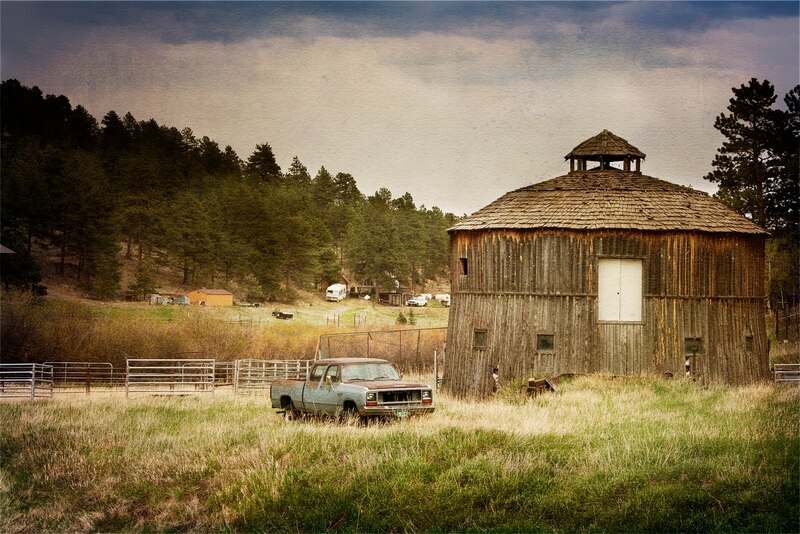 Back in May, I went on a scrappy retreat to a scrapping cabin located in Colorado and met a bunch of amazing scrap artists – many gals from here! This photo was taken while Kathi2, fellow scrapper friend, and I were enjoying a morning cup of coffee in the kitchen. 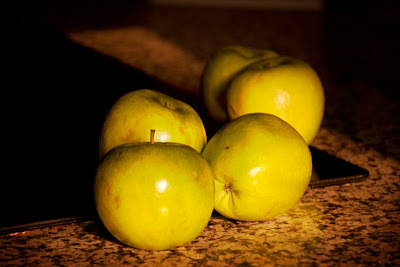 The sunlight was just dancing on these apples ever so perfectly. OK well - let me clarify the story a bit. A bunch of us were scrapping in the cabin. It's early and I was in need of coffee. So I ran to the kitchen for a refill. Well, wowzers! There was a whole fresh pot of coffee sitting there and no one in the kitchen. So I grabbed the coffee pot and delivered coffee to my new friends. Refills for all and smiles from everyone! I brought the coffee pot back to the kitchen, now empty. That's when I saw just how beautiful the apples were lit by the sun and started clicking some photos. At that moment, Kathi2, comes into the kitchen fresh from the shower and gives a big 'ol growl, typical of someone who needs coffee in a real bad way, but jrabs has just stolen it all. Kathi2 had just made herself a pot of coffee and grabbed a shower while it was brewing, never even thinking that there's a thieving crook amongst us ( in the form of JRABS). I used the Dusty Attic oval frame and made my flowers. 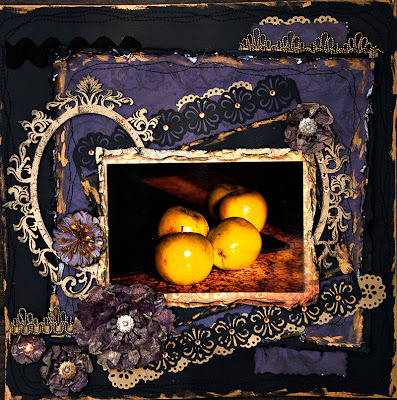 Created for Scraps of Darkness August Kit. This is a magnificent kit! 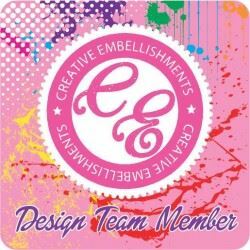 Come and visit and see how much fun you can have with this kit. I took this photo in 2009 for my photography class. We live in a region that has marvelous vineyards close by just perfect for a scenic fall drive in the country. My final project for photography class required a little day trip so my husband and I took to the road. He has always been so great about spontaneously stopping in the car for whatever comes our way. Back in the dating days, it may have been to stop the car and get fresh with me stealing a kiss. These days, it's to stop the car to take an interesting photo. Too funny how times have changed. As we were doing our sight seeing, I spotted a most amazing door. 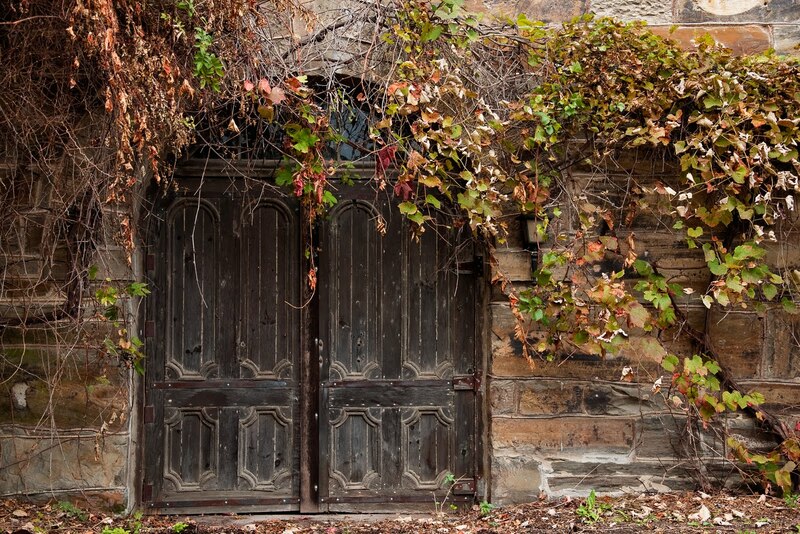 It was still standing, weathered and vine covered while the rest of the building had crumbled around the door frame. I think the vines were holding the doorframe in tacked. Like natures duct-tape - remove the "duct tape" vines and the whole mess crumbles to the ground. I am so very lucky to have a great accommodating husband - and he is so very lucky to have a wife that talks the language of duct tape, a mans language. 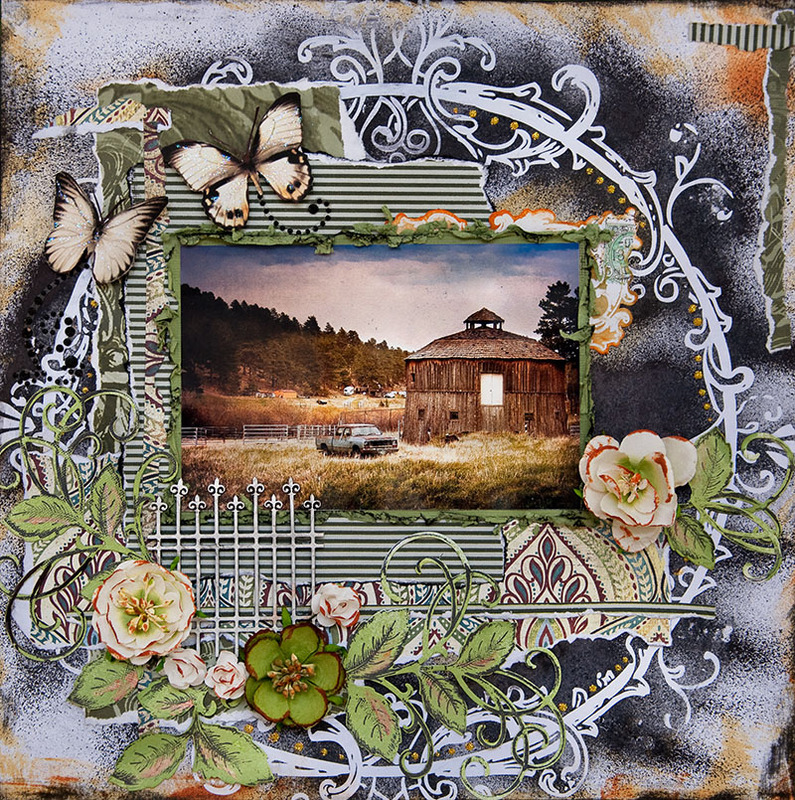 In this layout, I used the wonderful Dusty Attic vines and painted them with gesso to add some texture. 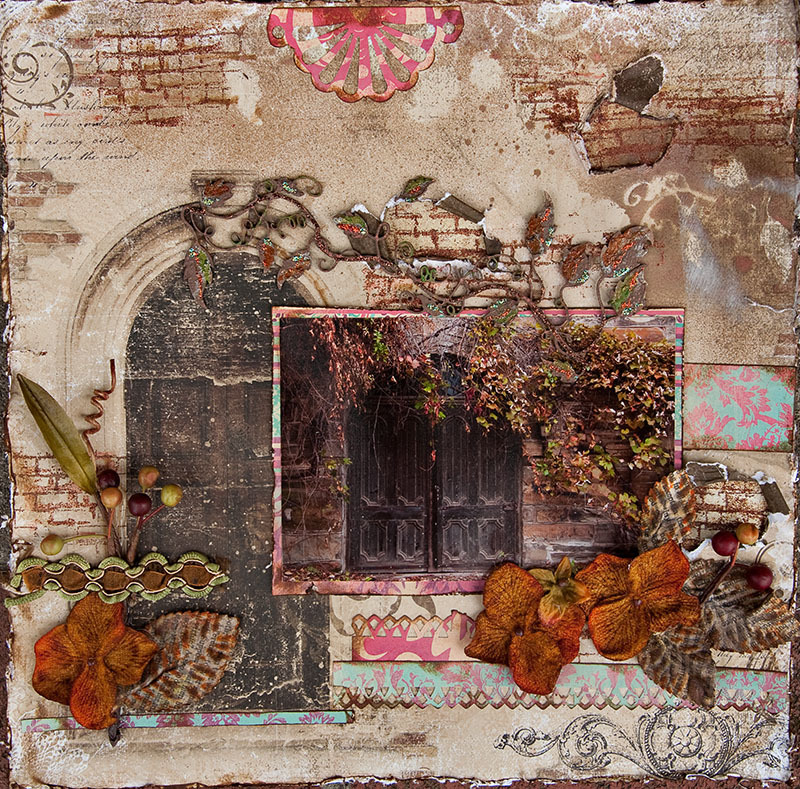 Then layered some Tim Holtz stain over it followed by stickles in various fall colors to emulate the Autumn feel of the photo. I swear BoBunny was standing right behind me when I took this shot and used the door as their inspiration for their magnificent piece of paper in the Timepiece collection. Right down to the bricks in the was crumbling away. The paper is every bit as gorgeous as the scene was. 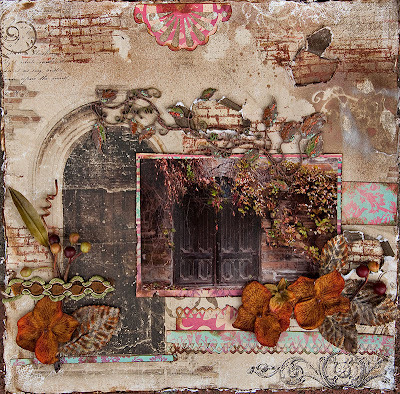 I used the Prima brick stamp to complete my crumbled building look. I used Tim Holtz Vintage photo Distressed embossing powder over the stamp.